Akshara Bridge converts between several kinds of text that represent Devanāgarī, romanizations of Devanāgarī, and other related scripts of India and southeast Asia. Devanāgarī is the alphabet that is used to write Hindi, Marathi, and certain other Indian and Nepali languages. Sanskrit is often written in Devanāgarī but it may also be written in a variety of Indic and Southeast Asian scripts. The conversion that Akshara Bridge performs is transliteration, i.e. conversion of sounds from one script to another. It does not translate, i.e. convert meanings from one language to another. Akshara Bridge source code • ZIP 900K • Akshara Bridge is written in Harbour and Harbour MiniGui Extended, and uses the UnicodeLib library. Input from an onscreen text box, a text file, or an RTF file. 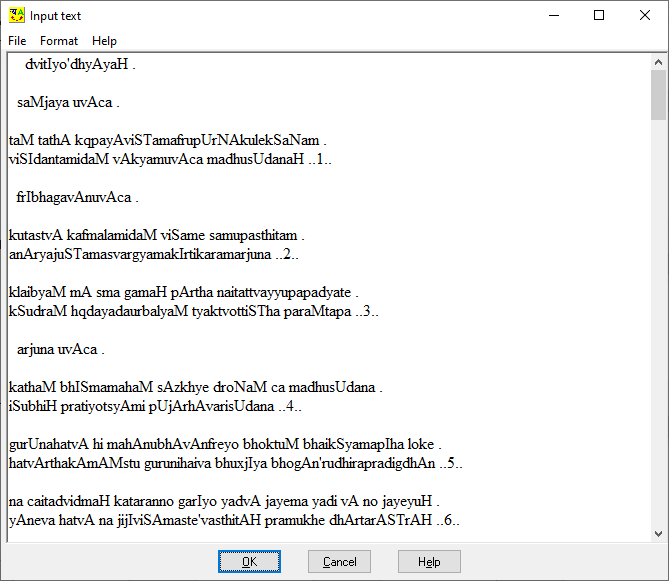 Output to an onscreen text box, a text file, or an RTF file. 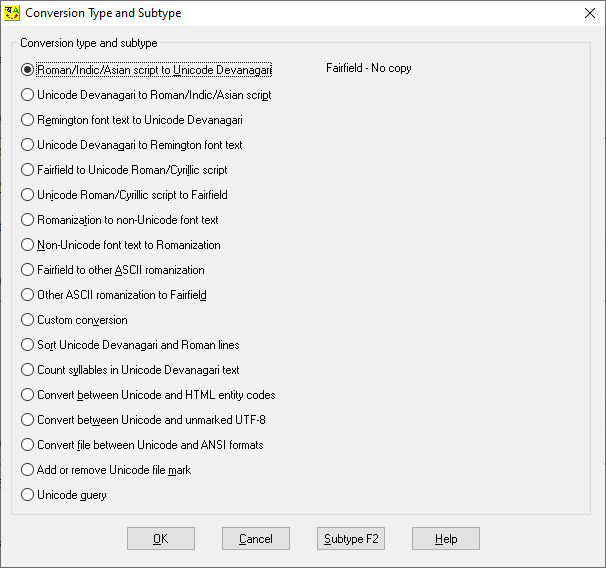 Conversion errors to an onscreen text box, a text file, or an RTF file. 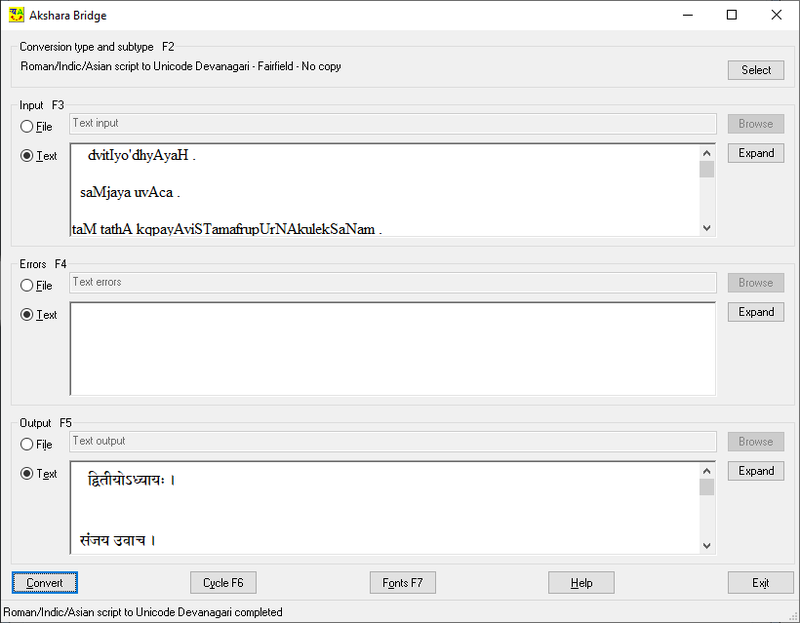 Sort text by Devanagari and Latin alphabet order. Count syllables in Devanagari text. Convert between ANSI, UTF-16, and UTF-8 formats. Detect, add, or remove a byte order mark (BOM) in a Unicode text file. Perform above operations on files with an optional command line program. Extensive help with glossary and detailed character charts. UnicodeLib library and source code • ZIP 100K • UnicodeLib is a Harbour library for processing Unicode text. UTF-8 and escape string analogs of AT(), ASCPOS(), LEFT(), LEN(), PADx(), SUBSTR(), etc. Akshara Bridge was launched on पुरुषोत्तम एकादशि, 11 June 2007.